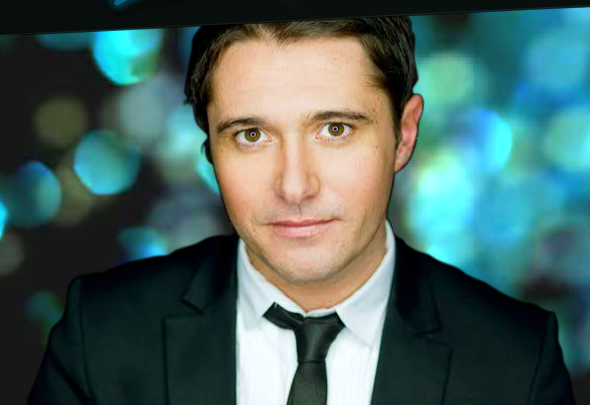 Over the past few years Kieran Brown has managed to firmly establish himself in the West End with roles in such blockbuster shows as: Love Never Dies, Wicked and the Les Miserables 25th Anniversary concert at the O2. As well as this Kieran is an established international concert and cabaret performer and pantomime veteran. Glasgow Theatre Blog had the chance to ask him some questions in a rare break from his hectic schedule. You’ve just finished appearing in Scotland’s biggest pantomime as Prince Charming at The King’s Theatre; tell us how the panto experience compares to your usual musical theatre and concert work. Well, I’ve done quite a few panto’s before, but nothing NEARLY as big (or important to me) as the Kings in Glasgow – it’s the one that I’ve wanted to do since I was a little boy, when I used to come see them as a child. It’s just been the most TREMENDOUS fun with the BEST company of people, who treated it with respect and care, which is what so many other panto companies and productions don’t do. The rapport that you get to have with the audience in Glasgow is second to none. Every friend of mine who visits Glasgow with a production mentions how “up for it” and friendly the audiences at the Kings are and it’s true! 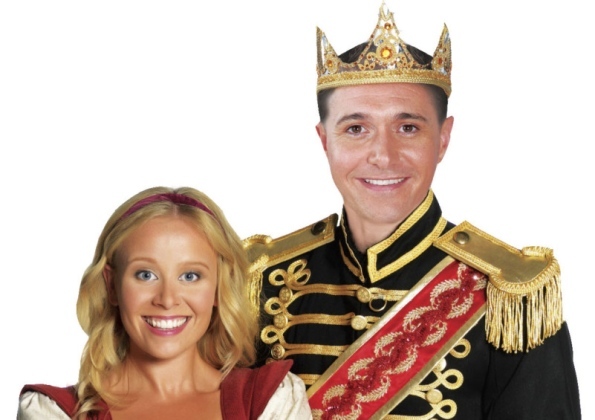 Jenny Douglas and Kieran Brown as Cinderella and her Prince Charming at this year’s King’s Theatre pantomime. Who or what inspired you to become a performer? Not sure really. Certainly I was encouraged by my old Drama teacher/Mentor, Bill Graham who died a few years back. He had a HUGE influence on me, from when he directed me in the Falkirk Children’s Theatre and throughout high school and my time with Tryst Theatre Company. He really gave me the very best base training, encouraged and prepared me for drama school. I’ll always be incredibly grateful to him for that. What advice would you give to any aspiring performer? Be realistic about your goals, don’t take anything personally, and persevere. If it’s really your passion, then take the knocks (and there are many!) but don’t give up. You have a full CV ranging from musicals, concert performances, cabaret, as well as directing; where does your heart really lie? At the moment it is still performing but I have done a bit of directing and I think certainly in the future it is where I want to go. I can’t see me ever wanting to give up performing, so if I can flit between then great. I am a bit of a perfectionist and a control freak and it is very hard when as an actor you are asked to do something by a director that you KNOW inside you is the wrong choice, but my job as an actor is to do what I am told. Directing however, is different, and a HELL of a lot more stressful, but it’s definitely what I want to do more of. I am currently assistant director for a very exciting new production of Chess at the Union Theatre. A very good friend of mine, Chris Howell is directing and I am enjoying watching his processes and reasoning as he guides his actors to get the best out of them and the piece. You have been involved in mega musicals such as Wicked and the 25th anniversary Les Mis concert; what is it like to perform in something so big and so beloved by so many? It’s quite surreal to begin with but the most important thing is to remember that these people love the piece and they have paid a lot of money to watch it, so you HAVE to do the best that you can do. With Wicked, it’s such a well oiled machine and is VERY carefully looked after by a brilliant team who know the piece inside out so you know you are in safe hands. It’s the same with most of the big, long(er) running shows. What I’d love though is to be involved in something new. That’s a real goal – to be in the original cast and create something that hopefully people will love in years to come. I am SO envious of all these amazing performers who were involved with the original productions of shows like Les Mis, or Phantom etc. That’s really a dream of mine. Wicked is known for its rather devoted fans; did you have any interesting stage door encounters with the super-fans? They are really the most amazingly dedicated bunch and I have met some real sweethearts and lovely people at the stage door, who’ve become good friends! The support from some of them has carried on after I left Wicked – a few even come up to Glasgow to see me do Cinderella and came to my cabaret “A West End Christmas In Glasgow” which I was really touched about. It’s always a bit disconcerting when you walk out of stage door and you see people “greenified”! I usually didn’t get recognised as I had to have a shaved head for the show. You do get a few who are a bit pushy/rude and are only interested in the two lead females, but on the whole it’s a great atmosphere. Takes a bit of getting used to. On our last night (Rachel Tucker’s last) it was CRAZY! I’ve never seen so many people at stage door anywhere before! My favourite was at the last night of Love Never Dies. Hundreds of people, and one lady asked if she could have a picture with me. I obliged (of course! ), and the woman behind asked if I would sign her programme. When I did, the lady with the camera came to me and asked if I was the Phantom. “I wish” I replied, then she said very disappointedly “Oh” and promptly deleted the picture of me right in my face…! I just laughed! I see you’ve worked extensively in Vienna as an actor, concert soloist, and as a director; can you tell us about that? I spent 6 years on and off living in Vienna and dividing my time between there and the UK. It’s really one of my favourite places to be and like my second home so I try to visit my friends there as much as I can. There is a great theatre scene over there and I worked for the International Theatre, which is now sadly closed, and the Vienna Theatre Project (sic). I recently did a series of three cabaret concerts called “West End Winters” with a German musical star Caroline Frank, which sold out, so we are hoping to make them a regular thing and do some more in a couple of months. There is nothing like that on the theatre scene in Vienna and word of mouth quickly spread so by the last night we had 30 people queuing for returns which was a lovely feeling! 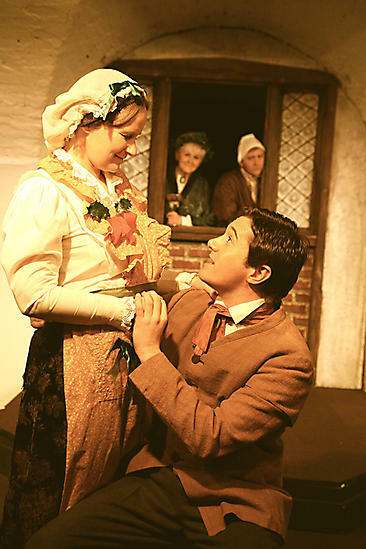 Vienna also gave me an opportunity to direct – I did “Over The Threshold” (which I was also in) and “A Christmas Carol”. It was a great place to dip my toes in the directorial water and I really learned a lot from the processes. What ambitions would you still like to fulfil? 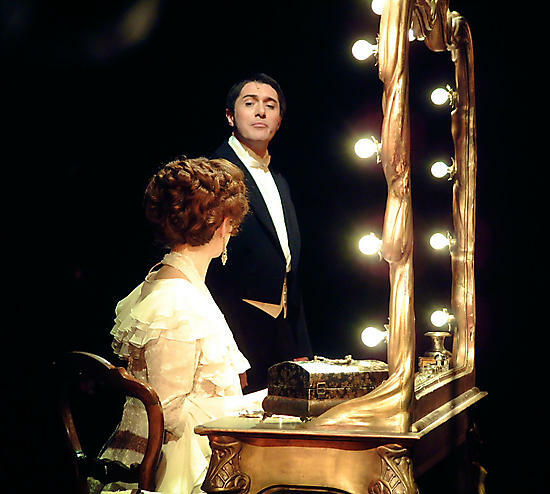 Well, to direct more, do a bit more TV again, and there are a few parts I’d love to play – Phantom in “Love Never Dies”, Joe in “Sunset Boulevard” (and there was me thinking I wasn’t such a Lloyd Webber fan!!!). I really want to do more plays/straight theatre again though. I’d love to do a period drama, like Bleak House, or Downton Abbey or something similar. If you could create a fantasy production to star in what would it be and who would you cast alongside you? Eeeek, this is a hard one! Well, ANYTHING with Dame Judi Dench, of course! Sorry if that’s a bit of a cliché but it’s true. What do you do to chill out when you’re not on stage? Not much! I find I have VERY little time – I’m always doing gigs or concerts so my spare time is somewhat precious! I’ve made a resolution to create more time for myself this year though, so we’ll see – maybe I’ll have time to discover a hobby! Tell us what’s next for Kieran Brown. At the moment, I have no idea! Chess will keep me busy for now, but I’m generally waiting on my agent to call with auditions! I will be back to Vienna I’m sure in the spring to do some more concerts, I am a guest performer for Annemarie Lewis Thomas (Principal and founder of the MTA in London), alongside the AMAZING Ria Jones, Shona White and Caroline Kieff at the Landor Theatre on Feb 15th. Other than that… watch this space! Finally, describe yourself in 3 words!